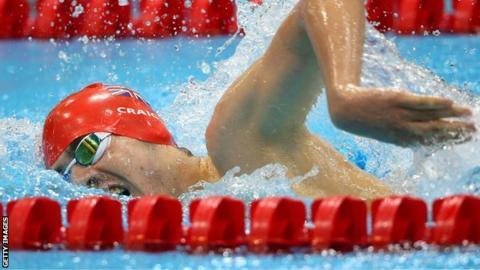 Josef Craig became Great Britain's youngest gold medallist of the London Paralympic Games as he set a new world record in the S7 400m freestyle final. The 15-year-old knocked almost two seconds off the previous record time in the heats and repeated that feat to finish in four minutes 42.81 seconds. "I was quite shocked when I looked around and saw the time," said Craig. Susie Rodgers then won Britain's 100th medal of the Games with a bronze in the women's S7 400m freestyle. Craig, who has cerebral palsy, trailed China's Shiyun Pan at the halfway stage, but took the lead with 150m to go and could not be caught. "Craig is pretty good already, even at 15. He has mild cerebral palsy, which affects some of his co-ordination off the start and in the water. I guess he could get better and go quicker, but as a start point his world record [of four minutes 42.81 seconds in the S8 400m freestyle] is a pretty incredible achievement." "I was worried [when Shiyun Pan was ahead], but I thought I'll do everything I can to catch him," said Craig, who is from South Shields. Craig was diagnosed with Graves' disease last summer, which resulted in a thyroid removal, and he only just recovered in time to secure his place in the ParalympicsGB team for London at the final trials in April. He said: "I wanted to start [my career] in Rio , but I now want to go there and smash that [world record] again." Team-mate and pre-competition favourite Jonathan Fox, who is from Cornwall but trains in Manchester, touched in fourth place and the 21-year-old tweeted: "Such a tough swim, I gave it everything and that's all I can do. Well done Josef, great time." In the women's SM9 200m individual medley, Swansea's Stephanie Millward, who has multiple sclerosis, pushed the sport's greatest-ever champion Natalie du Toit hard, but the 30-year-old had to settle for silver as the South African claimed her 13th career Paralympic gold medal. "I'm not on form if you look at my times and there have been a lot of political problems behind the scenes," said 28-year-old Du Toit, who will retire from swimming after the Games. "I cannot talk about it [the political issues] at the moment, but there's a lot of relief that I got up there and won the gold." Louise Watkin's impressive breaststroke and freestyle lengths helped the 20-year-old from Lancashire to win bronze in the event. Heather Frederiksen, who won S8 100m backstroke gold on Tuesday, could not repeat that in the 100m freestyle final but it took a world record from the USA's 12-time Paralympic champion Jessica Long to push her into the silver medal position. The 26-year-old's silver was ParalympicsGB's 103rd medal of the London 2012 and equalled the team's pre-Games target.